Captain Edward George Clarkson BAGSHAWE . 5th Battalion the Yorkshire Regiment. Son of the late Judge Bagshawe, K.C. 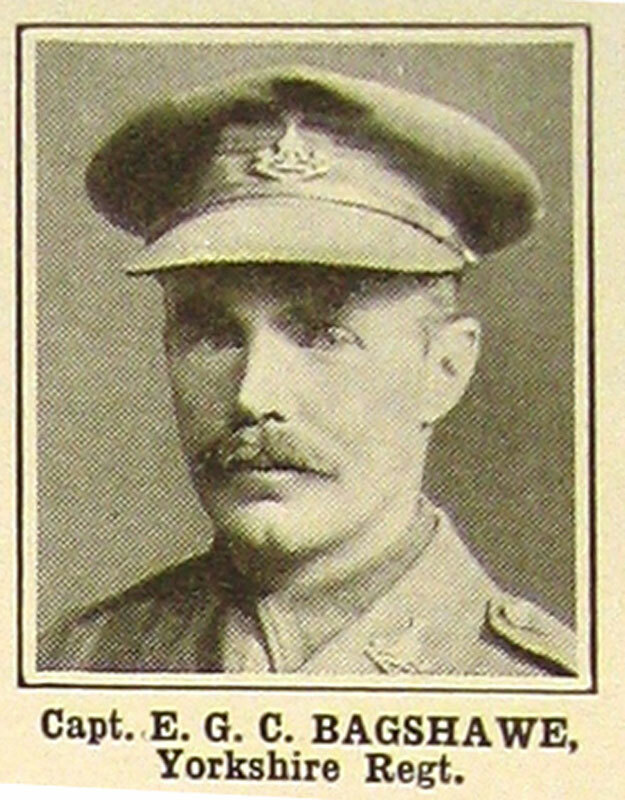 Killed 20 July 1916. Aged 36. Edward Bagshawe was born in Hampstead on September 17th 1879, the youngest son of his Honour Judge William Henry Gunning Bagshawe KC. Edward was a school friend of Mark Sykes who as Lt Col Sir Mark Sykes would be CO of the 5th battalion when the Great War started. Edward Bagshawe served in the Boer War and then resigned his commission in March 1907, only to rejoin at the onset of war and be gazetted Captain on August 29th 1914. He went to France with the 5th Battalion in 1915 but was invalided home only to go out again and rejoin his battalion in the Ypres Salient in 1916. In May of that year they were fighting at Eecke near Bailleul and from here they moved to Locre for trench work in and out of the line in the Salient. It is reported that the enemy artillery was very active from July 16th to the 21st. Captain Edward George Clarkson Bagshawe was killed in action on July 20th 1916 during these actions around Locre at the age of 36. His grave can be seen today at La Laiterie Military Cemetery at Kemmel to the south of Ypres. His name is also inscribed on the Sledmere Cross in East Yorkshire at the former home of his commanding officer Sir Mark Sykes.